We support legislation which would protect our unique desert heritage. 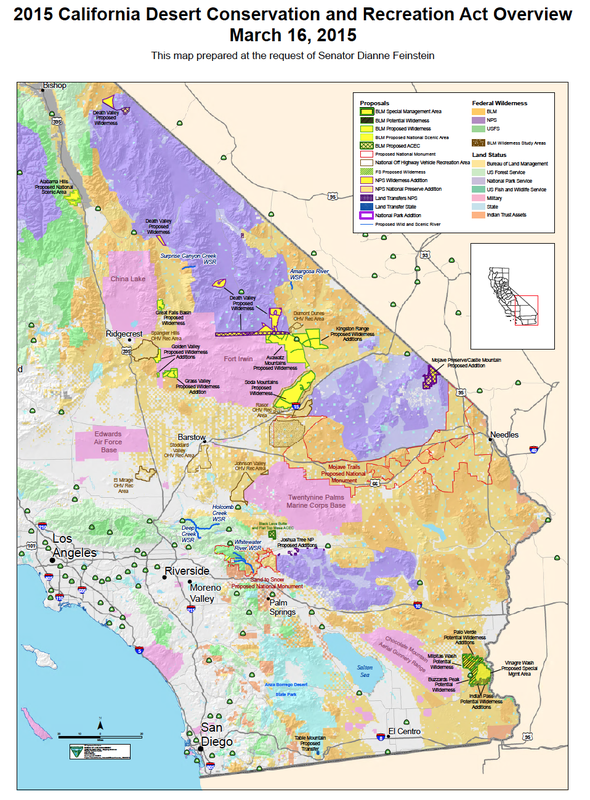 On February 9, 2015 Senator Diane Feinstein (D-CA) introduced the California Desert Conservation and Recreation Act of 2015 (CDCRA). This bill is a balanced approach to conserving our public lands, designating National Monuments, Wilderness Areas and Wild and Scenic Rivers across the desert, while also designating National Off-Highway Vehicle Areas to ensure sustained recreational opportunities in the desert. 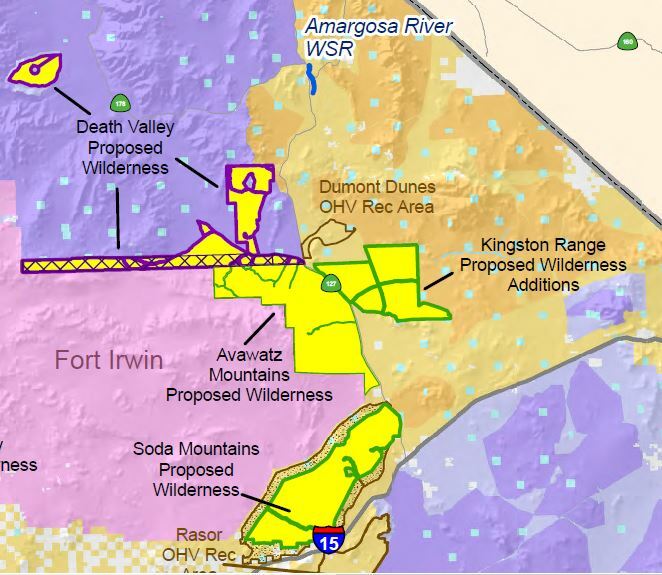 Proposed designations in the Amargosa Basin from the CDCRA. The Amargosa Basin stands to benefit from strong conservation and recreation provisions in the CDCRA. The Avawatz Mountains, the Kingston Range Additions, and the Soda Mountains are all important components of our watershed, and would all be designated as BLM Wilderness Areas. 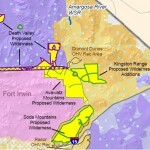 CDCRA would designate two additional miles of Amargosa Wild and Scenic River (WSR), connecting the privately held and vitally important Shoshone Spring to the existing 26 miles of WSR. CDCRA would transfer management of the infamous “Bowling Alley” to the National Park Service where it belongs, and designate much of the land as Wilderness. CDCRA would also designate Dumont Dunes as a National Off-Highway Vehicle Area. We at the Amargosa Conservancy are strongly supportive of such a designation. We believe that responsible Off-Highway Vehicle (OHV) recreation is an important part of the heritage of our public. After all, who doesn’t enjoy throwing the truck into 4WD and heading off into the desert? Designating Dumont Dunes will provide assurances of locations for OHV recreation. This designation will also promote economic development in the communities of the north Mojave Desert. Click here to find maps of the CDCRA proposed areas. Overview and detailed maps are included.